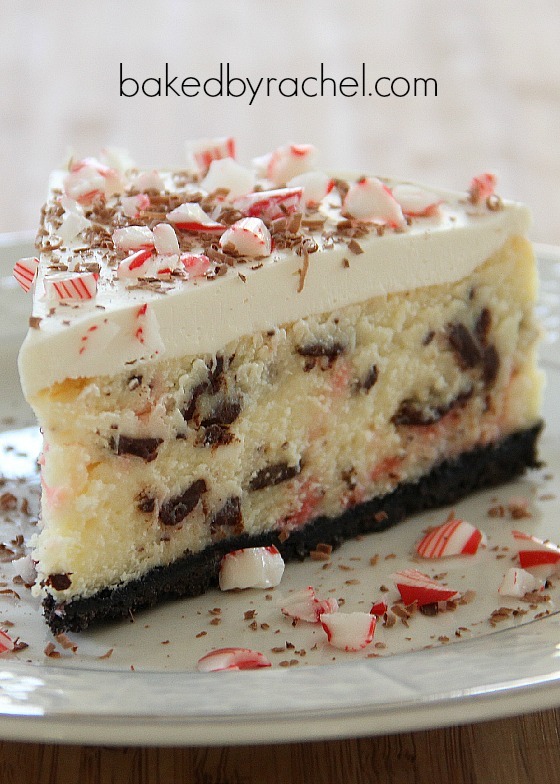 Peppermint cheesecake swirled with peppermint bark pieces, topped off with a layer of white chocolate mousse, bits of chocolate and crushed peppermint candies. You might think I love cheesecake. I don’t. I love making it though and my family loves eating it. Really, I’ll make just about anything even if I don’t personally like eating it. I know *ugh* I don’t like cheesecake. I’m sorry! I save that portion of my belly for things like apple crisp and apple pie. I’ve had this cheesecake on my mind since Thanksgiving when my brother mentioned it. I couldn’t get it out of my head! 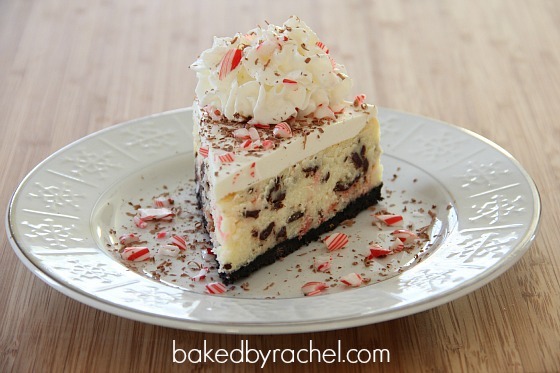 I’ve stared at the image of The Cheesecake Factory’s peppermint bark cheesecake a ton while contemplating how to make this. I had my fingers crossed tight that this experiment would work out. And since I’m sharing it… that means it worked! A total success. 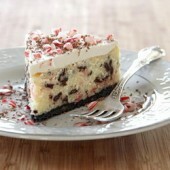 A white chocolate peppermint cheesecake sits on top of a chocolate cookie crust. 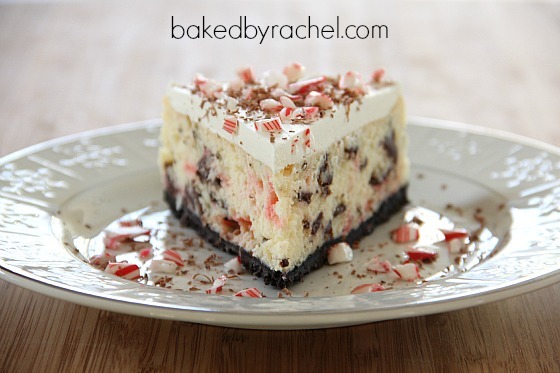 It’s swirled with peppermint bark pieces, topped off with a layer of white chocolate mousse, chocolate shavings and crushed peppermint candies. Go ahead and wipe the drool away. This takes more time to make than the average cheesecake but it’s absolutely worth it for something extra special. 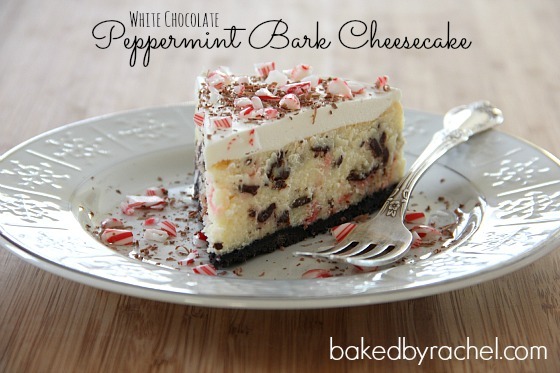 Before preparing the cheesecake, the peppermint bark needs to be made. It's best to do this step at least a day ahead. Melt 4oz dark chocolate with 1/2 tsp vegetable oil. Mix in 1/8 tsp peppermint extract. Spread thin over a sheet of wax paper on a baking sheet. Chill for 15 minutes. 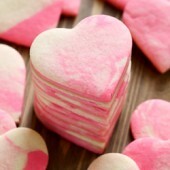 Melt 4oz white chocolate with 1/2 tsp vegetable oil. Mix in 1/8 tsp peppermint extract. Spread over chilled dark chocolate. Sprinkle immediately with crushed peppermint candies. Chill for at least 15 minutes. (*when melting chocolate, if using a microwave be sure to use the 30 second 50% power method stirring well after each 30 seconds). Preheat oven to 350°F degrees. Prepare a 9" spring-form pan by wrapping the outside with two sheets of heavy duty tin foil around the bottom and up the sides. In a food processor, blend cookies until only fine crumbs remain. Add melted butter. Give a quick blend. Transfer crumb mixture to spring-form pan. Shake to disperse crumbs. Using a flat bottom cup, press down to create an even crust. Bake crust for 10 minutes. Set aside. Reduce temperature to 325°F degrees. Chop peppermint bark into small pieces. Set aside. Begin melting 4oz white chocolate. Using a double boiler or heat safe bowl, melt over simmering water. Stir until fully melted. Using the microwave, in a heat safe bowl microwave for 30 seconds at 50% power until fully melted. Stir well after each interval. Transfer spring-form pan and cooked crust to a larger pan, such as a large roasting pan. Pour filling into crust. Add enough hot water to reach half way up the sides of your spring-form pan. Carefully place in center of oven. Bake at 325°F degrees for 1 hour. Turn off the oven. Keeping the door shut, leave the cheesecake in the oven for an additional 45 minutes. Remove and allow to sit for at least 1 hour before chilling. Chill 4 hours or overnight before adding the mousse. In a medium bowl beat softened cream cheese, melted white chocolate, cool whip, sugar and vanilla until smooth and slightly thickened. Carefully remove side of spring-form pan. Spread mousse mixture evenly over cheesecake. Chill for 4 hours or overnight before serving. 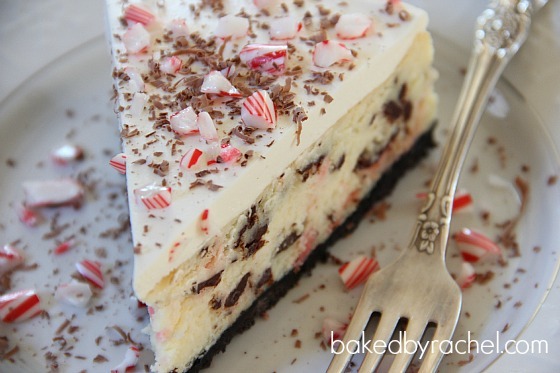 Serve slices with chocolate shavings, crushed peppermint candies and whipped cream. **Note: I used Ghirardelli white chocolate and Ghirardelli 60% cacao bittersweet chocolate. One reader will win one Calphalon non-stick springform pan. The nitty gritty: You must have a US shipping address to enter. Giveaway will run from Dec 14, 2011 – Dec 17, 2011. One winner will be randomly chosen and contacted via e-mail Dec 18, 2011. Winner has 24 hours to respond or another winner will be chosen. Main entry must be done or bonus entries will not count. Duplicate entries will be deleted. This might be a stupid question, but on the ingredient list, it said 2C chocolate cookie crumbs and 1C sugar, what is the C in there means? How much would 2C and 1C and 1/C is? HOLY MOTHER OF PEARL! This looks like heaven! 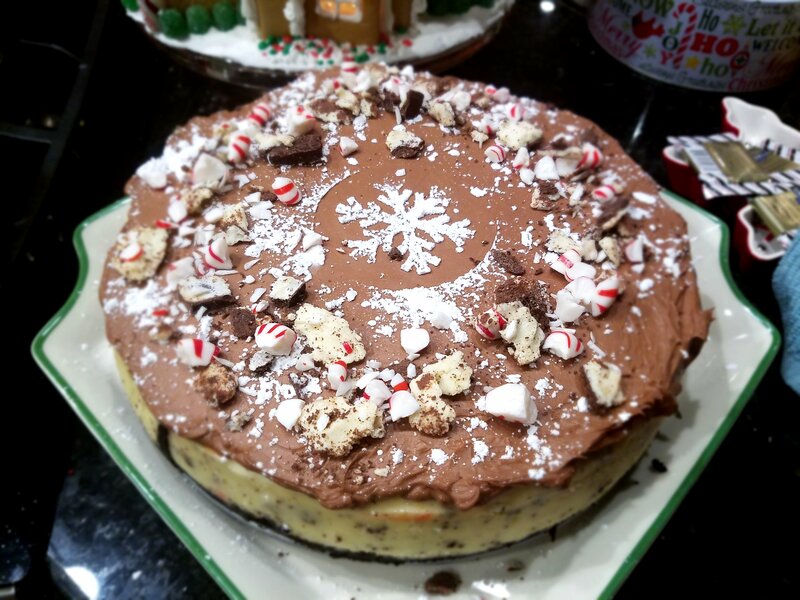 I’ll be making this cheesecake for Christmas Eve and I’m hoping it’ll prompt a future marriage propsoal HAHA! Thanks for posting! I just made this for Christmas today for some friends, Im excited to taste it, it looks AMAZING. I made this for Christmas Eve celebration and it was perfect! I used Ghirardelli peppermint bark (18 squares = 1 1/2 C – milk choc. not the dark) and Ghiradelli white chocolate chips (4 oz. = approx. 3/4 C) in the cake. I doubled the mousse recipe and used the other half to top my chocolate cheesecake. I used the store brand of extra creamy cool whip as the first ingredient listed was milk instead of hydrogenated oil. I also used your timing and direct water bath on my chocolate cheesecake. I have always put a pan of water on the rack directly under the cake and then baked at 325 for 1 hr 5 mins. Almost all of the cheesecake recipes I have use that timing method. My chocolate cheesecake was the best I have ever made! I will use your timing method on ALL of my cheesecakes going forward. I made this for dessert to enjoy after our family’s Christmas dinner. It was absolutely delicious! I was afraid that the family would be overwhelmed by the peppermint extract in the cheesecake itself, so I omitted that. Other than that, I followed the recipe exactly and it came out perfectly. It was a big hit! Thank you for the recipe! Hi! Making this for Thanksgiving this year- so I don’t have a ton of time, so I was going to try to break the steps up in a couple days… Do you think the cheesecake would be fine if I baked the cheesecake on Monday evening, and did the Mousse Wednesday night, for it to be ready by Thursday? Or is that too early? Should I try to do it sooner to Thursday? This looks amazing! When you say prepare the pan with 2 sheets of foii what exactly to do mean? Just on the bottom of the pan? Wrap the exterior of the pan with 2 layers of foil. This prevents water from entering the pan while baking in the water bath. Oh my goodness! This is amazing!! I made it the other night-first cheesecake I’ve ever made-and it turned out PERFECT. I followed the instructions exactly and the consistency came out perfectly. Next time I will add more Oreos for a thicker crust but other than that it was perfect. I made it for my family because we have a tradition that on Black Friday we go get lunch at Cheesecake factory and get a slice of this perfection; however, we could not make it this year-so to keep the tradition alive I decided to make it. Let me just say that they were amazed, liked this crust better than the actual one, and prefers this cheesecake instead of the other one now. We all get together for Christmas and make dinner and my family is in charge of the dessert-lets just say after multiple requests, this will be the dessert! Thanks so much for sharing this amazing recipe, it’s truly delicious!! How do you wrap your pan to prevent leaking? Do you wrap it on the inside or the outside of the pan? Wrap the outside of the pan around the bottom and up the sides with at least 2 heavy duty layers of foil. Do you spray the inside of the pan at all or line it with anything? Sorry for the questions, I just want to get this right. It’s usually not necessary as long as you have a good non-stick pan. However, if you’re concerned, a light coating on the sides would likely be okay. This is such a great recipe! I’ve made it twice this holiday season for different celebrations. It’s so fancy, yet fairly simple to make. Thank you for posting! The key to this recipe is that it continues to sit in a warm oven after the full cook time. So even at the one hour mark, it shouldn’t be completely ready to be removed. It will continue to slowly cook for the additional time sitting in the oven. However, if your oven does not cook at the proper temperature, definitely adjust the temp or time as needed. Has anyone tried to modify this to be gluten free? I’m guessing Glutinous “Oreos” would substitute fine but wasn’t sure about the 1 1/2 tbsp flour. I have all purpose gluten free flour but I know it doesn’t always substitute well. In this case, you may be fine leaving the flour out since it’s such a small amount or use gluten free flour. The gluten free Oreo alternatives would work fine for the crust. has anyone frozen this for a few days or a week. how does it thaw. should you put the whip topping on and freeze or thaw and then put it on? For best results, I’d recommend freezing without the white chocolate mousse and additional toppings. Add those after thawing the cheesecake fully. How long will this keep n fridge? Can you make ahead and freeze? This will easily keep in the fridge for up to a week. You can absolutely make it ahead and freeze it. 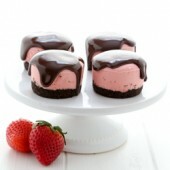 If choosing that method, be sure to add the white chocolate mousse and toppings after thawing it. Can you use whipped cream instead of Cool Whip in the mousse? It doesn’t have the same consistency and will not hold up as well, so I would not recommend it. I received some 4.4 inch springform pans last year – and I would love to make this in the mini version. Can I divide this? If so – between 2 – 3 pans. And how long would I bake it? I haven’t made this into that size so you’ll need to eye it as you go. Start with two and if you have tons of extra, a third can always be added to your plans! :) Good luck and enjoy!